The Kingdom was a shadow of its former self – colder, harder, less fruitful. Leaving one’s home was not a thing one did, once. But people did it all the time now. It wasn’t his fault. People told him he was one of the best Kings that ever was, in his time. The shifting wind was as inevitable as change itself. Change is good. None of his children wanted the red crown, which pained him some. In fact, only one of his children remained in the village. One of seven. He knew she would leave too one day, but she would not abandon him here while he lived. Some are always left behind, when the times change. And the times always change. (Click for a closer look) I don’t know about you, but I find it all quite inspirational. Makes me want to do more and better art! This entry was posted in ATCs and ACEOs, Copic Markers, Progression Photos on July 21, 2013 by The Beast Tender. A big fan of your work…. great talent. 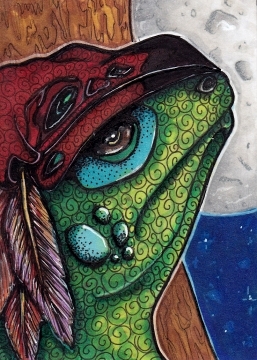 Lizard King is elegant….love the burgundy beret and the night moon. The Forest People Swap compilation is amazing…..so much talented work and when placed together looks awesome! I’m inspired myself! He is so beautiful, his expression perfect and the story… ah! the story. Well, you know me, I think you should write a book with all these characters of yours. Have a great week, Cindy!!! Cool collection forest people…would have been nice to keep them all and do an exhibition! Love the lizard, and that’s an impressive amount of work in all those little cards. Good job! I hope you’re patting yourself on the back. Oh, how sad. I see the story in his eyes. I mean, before reading the words, I knew that he was a noble man who carried a big grieve, with grace. That is quite a collection of forest people! I love the lizard king. He looks quite handsome in his red crown. He looks like a wise king, I love his eyes and the crown with feathers. The forest people portraits are awesome!!! I really like the “Lizard King”, Cindy, but what really caught my eye was enlarging and surfing the swap cards. Wonderful!